Welcome to the final week of the 36 patch quilt along! Today is assembly day. The first step in assembling the quilt top is to lay out your blocks. Generally, I like to rearrange the blocks as little as possible, because it seems like once I start moving things around, things get worse rather than better. Random is good! Take a digital photo and view the thumbnail. This helps you get a good overall view of how the quilt will look. I do this almost all the time, with nearly every quilt. When I viewed this photo, I did notice a problem area. In the second row, the second and third blocks from the left bothered me. I didn't like the pink and the red blocks next to each other. I shuffled a few blocks and took another photo. This arrangement looked much better to me. Once the blocks are in a pleasing arrangement, the assembly is as simple as sewing the blocks into rows and then sewing the rows together. If you pressed all the strips toward the dark, and all the rows in each block toward the top, then the assembly should be pretty easy. Take every other block and lay it right side up (so the seams point up) and every other block upside down (so the seams point down). I'm showing the backs of the blocks to illustrate this. Pin the blocks to each other and sew the seam. All the seams in the two blocks should nest together, making it easy to join the blocks. Repeat for all the blocks in each of the rows. After you have the rows together, press every other row to the left. Press every other row to the right. Pin the rows together, sew and press well. 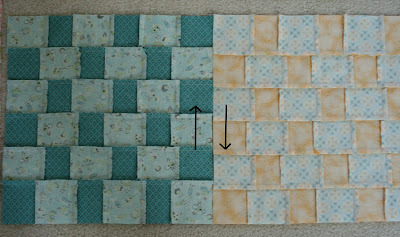 I pinned at each intersection when joining the blocks together and at each intersection when joining the rows together. It's a LOT of pinning, but it helps the blocks line up nicely, so it's totally worth it. Press the entire quilt top well. Stand back and admire it! Here is my finished quilt top! It's pretty busy, but I must say, it turned out better than I had imagined. I LOVE it! It measures about 72" square. It was all from my stash, and boy, does that feel GOOD! Now, I just need to figure out how to quilt it! I've been thinking about it, but haven't settled on anything yet. Also, I wanted to let you know, Tara and I are planning our 3rd annual quilting retreat/workshop in Fort Collins, CO. The dates this year are November 11-13. I can't believe this will be year 3! (Woohoo!!) I'm very excited to be a part of it yet again. I will be teaching machine quilting, both free motion and walking foot quilting. We will have a workshop segment, where you can bring a quilt top or two for input on how to quilt them. I am also going to teach a quilt as you go option for joining all your quilting samples/blocks into one quilt. So, ideally, you should be able to leave the weekend with a finished quilt. There will be great fun, lots of sewing and amazing food! You can read more about the details and registration here. I know from experience that Tara throws an awesome retreat! Hope you can join us! The quilt is really pretty. I wasn't sure when you began, but wow, is it lovely. What an inspiration. How goes the craft room redo? Too busy?! I love it, it's gorgeous! You're layout turned out perfect! Happy monday to you, too :o)! Completely dig this one. It's on my to-create list!!! looks good! I am pretty happy with mine too. Once I get it together, I am thinking about quilting diagonally, but not every row, maybe just every other row. We'll see once I am to that point. I still need to make the back and I know exactly what I am doing for that. I will post on flickr when I am done. Thanks again for a great project that helped me to bust some stash and pushed my creativity in choosing fabric. I love how this turned out, I will definitely be making one in the future!! This looks great! I love, love, love how it turned out! Ta da! It's gorgeous! Such fun to see it come together. Beautiful! Love that this all came from your stash. This is a great quilt! And to know it came from your stash makes it even better! Oh.My.Gosh! I LOVE that quilt! Looks good! Can't wait to see it in real life. Must start looking at flights! I love how it turned out. I have enjoyed the whole process and hope to do it one day. Thanks for sharing. I love your quilt top, too. Lately, I have noticed that leaving the blocks pretty much alone, and not overthinking the layout is best. I need to make this quilt! I love it! What a great quilt! That is great advice on not arranging because once you start there is no being happy with the arrangement.......it really does just muddy things up too much. Your top looks fabulous.....so simple yet so artful at the same time. I love the finished top. I think it is great that it was all from your stash. Looking into the retreat. I would love to come. That turned out great. Those were a lot of pieces to nest up together and it looks wonderful. Two great tips here--pinning and thumbnails. It's amazing what you can see through a lens that is not obvious by the naked eye. I'm still about 14 blocks shy but remain motivated to destash, destash, destash so I too can sit back and revel in that oh, so good feeling. Thanks for the great QAL! I love the scrappy quilt top you have shared and helped me create. Wow! Looks amazing! Great job! I don't think it's too busy at all! Great Job Crazy Mom! I love the bright, happy look! I love love love your quilt. I loves me a busy quilt! I wanted to join this qal but....it is on my to do list. Love your fabrics and the look of the entire quilt. Also, when I was making my 25 patch quilt, I also, pinned at every intersection and it was totally worth it. Good advice from you! Love your blog. This is really fabulous! Great job with your stash fabrics! Funny how looking at a layout thru a lens can be so revealing. Good luck choosing a top-stitch design. Can't wait to see what you pick. Yes, random is more work! Your quilt is BEAUTIFUL!! And I don't think it's busy! Or if it is, it's not busy in a bad way. It's really nice. Wish I'd come across your blog sooner so I could have joined in your QAL - love it! Will need to make one of these sometime! Yours is so uplifting in those bright colours! I love this quilt! I still have the remaining 15 blocks but all the fabric is chosen and paired together. I can't make the retreat this year (boo...) but I'm planning on next year because I've already decided that is what I want for my birthday (which is in November)! It's a big one (*sigh*), so I should have some fun, right? Love your 36 patch! Really love the idea of photographing the layout before settling on it cuz your newly rearranged layout looks great. So perfectly seamed and pressed too! Is it really year 3 already for your Fort Collins retreat?! Would love to go with you, so I'm off to check out the deets! I had my doubts about this quilt, if I would like it much, because it seemed way too busy for my taste. but now that the top is assembled, I looove it! your quilt looks beautiful! i just loved this quilt along! thank you so much for hosting it! i've got a few more blocks to finish and i will have enough (72) for a king sized top. should have the blocks finished this week. i'm thinking that i might want to put a one inch (finished) strip between the blocks and rows of white. just to break it up. not sure yet. any thoughts? thanks again! Your quilt top look gorgeous!! I love that it's all done from your stash. Such a great stash busting project. The quilt is fabulous...I love it and hope mine turns out half as lovely! It's like a psychedelic table cloth. I love it! GREAT JOB! I love to see quilt tops come together and this one deserves the praise! Your top is wonderful! I have 15 blocks so far and am loving them. They sew up very quickly and use stash. It's a win, win. Beautiful and intricate! Love the step by step instructions. I have a beautiful heirloom quilt that I store in an elegant fabric bag that protects it in my closet when not in use. It's called a "coverture" from www.CacheCachet.com I've also bought covertures to gift package and present a quilt to a friend. Your quilts are worthy of these!! It turned out just great, Amanda Jean! I'm like you....I don't like to start fussing with it too much, because like you say, things just get worse. I this case, I agree that the change you made was just the ticket! Good job! 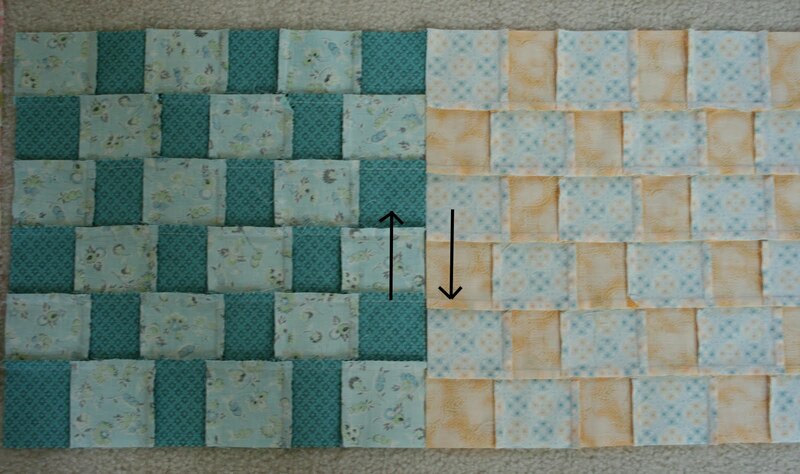 I tried this block with smaller strips and love them, too.